On October 16, the Food and Agriculture Organization (FAO) of the United Nations celebrates World Food Day, promoting actions towards achieving Sustainable Development Goal #2 – Zero hunger by 2030, which is particularly relevant for countries in Sub-Saharan Africa. The accurate mapping of grasslands, forests and crop fields, as well as the detection of changes in land cover over time form a cornerstone in many applications on crop monitoring. Using 100 m and 300 m PROBA-V imagery, together with 10 m resolution training data and several ancillary data layers, the Copernicus Global Land Service generates a novel, yearly map. 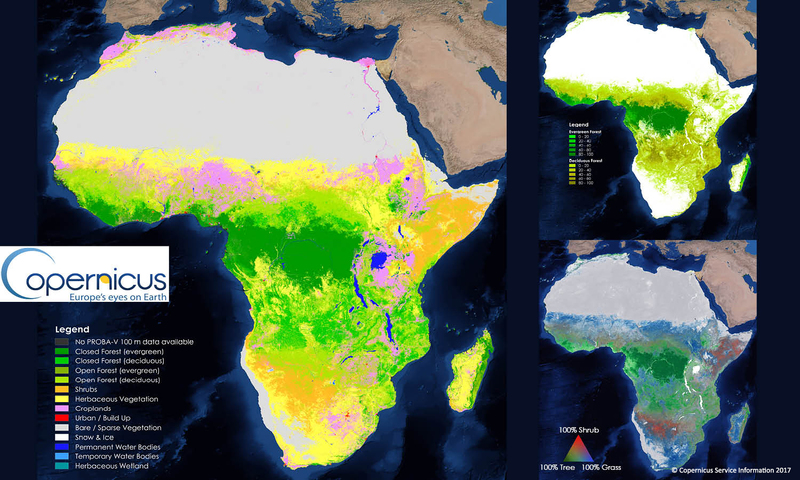 The validation of the first map over Africa, for 2015, revealed a higher classification accuracy compared to existing global land cover maps, notably in the Sahel, Botswana and Madagascar. However, the major improvement is delivered by the cover fraction layers for tree, grass, shrub and bare soil, allowing users to tune the default land cover classes to their specific needs. Read more at VITO Remote Sensing's blog!